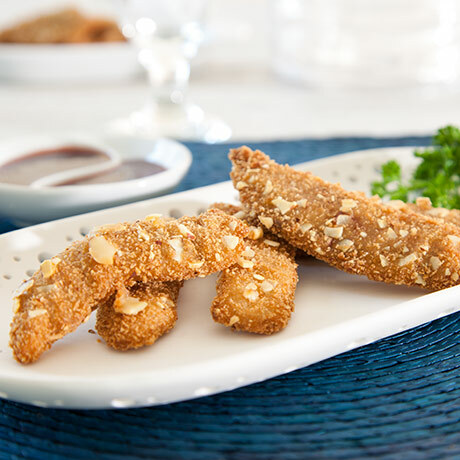 As ethnic flavors continue to spice up restaurant menus in 2019, Maple Leaf Farms is introducing two authentically seasoned gourmet marinated duck tenders to the foodservice market. The new seasoned duck tenders are available in two on-trend flavors: spicy North African with chili peppers and curry-based Southeast Asian. According to a recent article in Food Ingredients First, Hudson Riehle, senior vice president of the National Restaurant Association’s Research and Knowledge Group, said that these flavors are influencing the restaurant industry. The flavor profile for the North African tenders was developed with input from Maple Leaf Farms International Marketing Manager Hamza Rouached, who is from Tunisia. Both the North African Duck Tenders and the Southeast Asian Duck Tenders were tested with several industry chefs prior to launch. The flavor profiles, ease of use and versatility are what appealed most to them. The seasoned duck tenders come in 10-pound cases, each with five two-pound bags. The products come frozen for convenience. Once thawed, the seasoned tenders will cook in just minutes and are perfect for wraps, stir-fry or topping grain bowls. To support the new launch, Maple Leaf Farms is offering restaurant operators a rebate for one free case with the purchase of two cases, now through January 31, 2020. For more information on the product or special promotion, visit http://www.mapleleaffarms.com/foodservice. Maple Leaf Farms, Inc. is America’s leading producer of quality duck products, supplying retail and foodservice markets throughout the world with innovative, value-added foods. Founded in 1958, Maple Leaf Farms is a fourth generation, family-owned company. For more information, contact Maple Leaf Farms at 1-800-348-2812 or visit http://www.mapleleaffarms.com.